You've heard of strawberries and cream. Raspberries and cream. Even blueberries and cream. But what about cranberries and cream? Probably not. But why not? Cranberries in their raw and natural state are loaded with tart, tangy flavor and antioxidants. Why would we want to avoid those? I decided that mincing my fresh cranberries in the food processor would get them to the perfect edible consistency of a topping, say, for ice cream or a salad, or the base, say, for some cream. 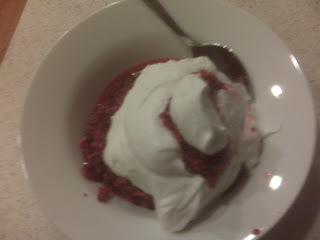 I had ran out of ice cram and actually did have some whipping cream, so I decided that cranberries and cream it would be. First though, I zested and juiced one lemon into my minced cranberries, along with a heaping tablespoon of sugar. The sugar elicited the natural juices of the berries and added some much needed sweetness to the tartness of the berries. This made it a great dessert: juicy, sweet and tart. Maybe a little too much so. It needed that cream still to temper the sweet and the tangy. So I whipped the cream with a little sugar, salt and vanilla extract and layered it a little in bowls with the cranberries. It was like a little free-form sweet-tart parfait. I found the taste to be just what I look for in a satisfying dessert – light; not too sweet, with a balanced, deep flavor. This packed all of those things, as well as a little punch. It's not like I sweeted away all the tart just because it's dessert. I'll call it the tangy and very necessary punch of the antioxidants.